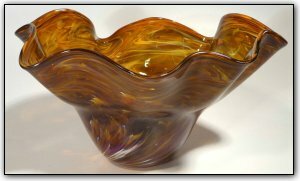 This fluted bowl features many shades of deep and rich gold topaz, with a few purple highlights on the outside near the bottom. The colors are absolutely gorgeous, and the interior is so vivid and rich coming together in the center in a luxurious swirl surrounded by stunning highlights. Make sure to zoom in and see the intricate, almost lacelike patterns as the colors interact with each other... so amazing!